Buxton Daeblitz Orr was born in Glasgow in 1924, 18th April. He was no relation to Scottish composer Robin Orr. He came from a musical and theatrical background. His grandfather Richard Daeblitz led the second violins of the Scottish Orchestra and his mother Marie Daeblitz was a stalwart of the Glasgow Citizens Theatre Company. Buxton trained as a doctor but gave it up to study music. 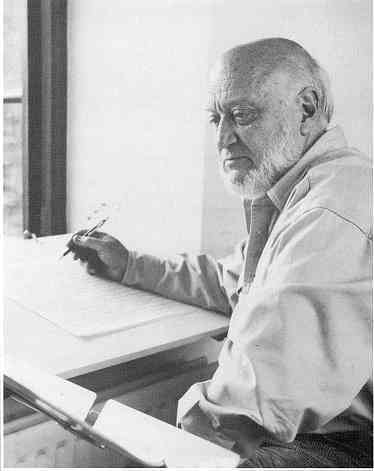 He studied composition under Benjamin Frankel and was to follow Frankel’s lead in writing music for films. He used the serial technique in composition, using a form of the 12-note row. In 1961 he composed an opera The Wager and a song-cycle The Echoing Green, but many of his best-known film scores also date from this period. His film credits include : Grip of the Strangler (1958); Fiend Without a Face (1958); Corridors of Blood (1958); First Man Into Space (1959); Suddenly, Last Summer (1959); Doctor Blood’s Coffin (1961); Snake Woman (1961); The Eyes of Annie Jones (1964); and Walk a Tightrope (1965). Many of his film scores are for horror pictures. His incidental music has also been used in Doctor Who episodes. His work often included Scottish themes too :- Canzona (1963) and Songs from a Childhood (1968) are based on various Scottish poets works; A Celtic Suite for string orchestra appeared in 1968; Highland Complaintes and Fancies (1976); and A Caledonian Suite (1980). He was to receive commissions from Glasgow University, BBC Radio Scotland and the Saltire Society. In 1965 he joined the staff at the Guildhall School of Music and Drama. He founded the Guildhall New Music Ensemble in 1975 to encourage his students to play contemporary scores. He gave up teaching in 1990 to devote himself fully to composition. His Narration for symphonic wind ensemble appeared in 1993, and a String Trio in 1996. He was to write operatic fantasies like Catfish Row and Tales from Windsor Forest in 1997. He died in 1997, 27th December at his home in the Wye Valley. You are currently browsing the archives for the Buxton Orr category.